In 2017, Google has proven once again that if there is one thing that never changes, it’s their ability to continuously change. We keep track of all the significant Google My Business changes, tests and rollouts and it is already over thirty items long for this year alone. Here’s just a small sample. (Feb-March 2017) Google rolls out 3-pack ads. (March 2017) Google rolls out moderation on desktop to Level 5 Local Guides. A few weeks later it rolled out to everyone. 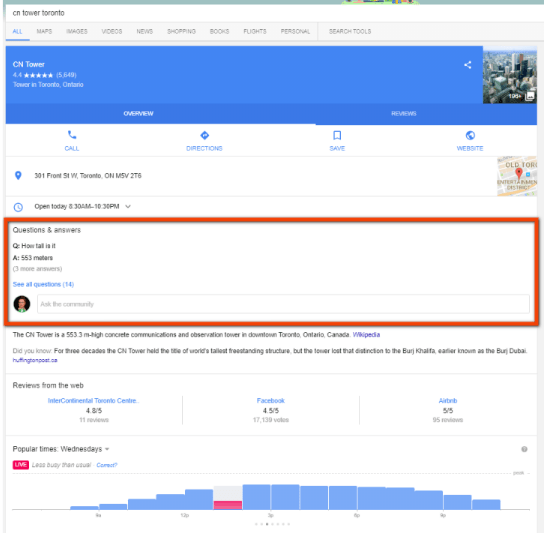 (April 2017) Google adds menu field to GMB. 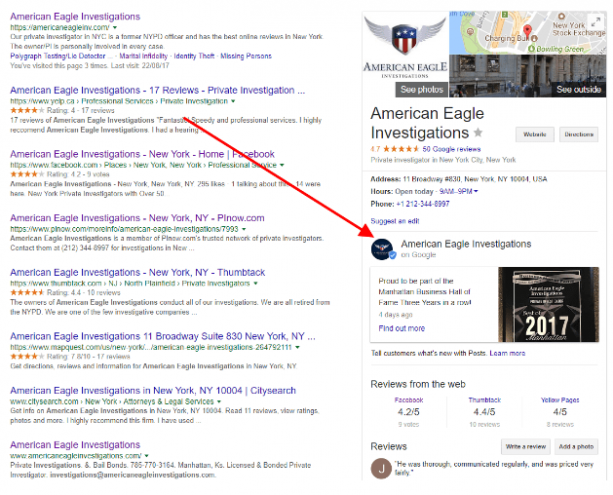 (April 2017) Google adds bulk insights. To say that it is important to stay on top of all the changes as a marketing agency or consultant goes without saying. Staying on top of all the changes for a business owner is important too. And this is becoming more and more the case with the rollout of some specific GMB features that require constant support and attention from not only the marketing agency who is managing GMB listings, but also the business owner who needs to participate. I’ll go into some detail about two of these features, including how to make sure you are getting the most mileage out of them for your business. 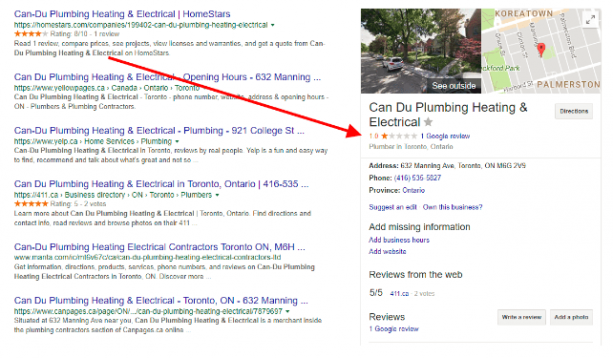 Essentially, Google Posts allows a Google My Business listing to post content directly to the Local Knowledge Panel. In contrast, Google+ Posts only really show up if the user/customer is using Google+. Google+ posts don’t show up in search very well at all unless the post has a lot of comments. This is a great way for business owners to take more control of the digital real estate that is their Google homepage. 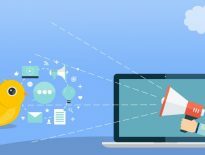 To learn even more about how to optimize your “homepage” check out this article by Mike Blumenthal. The posts have unique URLs that you can share by clicking on the post. These URLs are not currently indexed by Google so they won’t rank independently (unlike G+ posts which do). The posts only stay live for 7 days unless it’s an event. In that case, it stays live until the event is over. A silly feature is that if you post the event and it’s less than 7 days away, the event still stays up for 7 days. So it’s either 7 days or when the event is over — whichever is further away. Animated gifs and video are not currently supported. Google will scroll up to 10 posts in a carousel but only about 2.5 are seen without scrolling. Google launched Q&A for Google Maps on August 8, 2017. This feature is currently only visible on the Google Maps app for Android and also on mobile browsers. 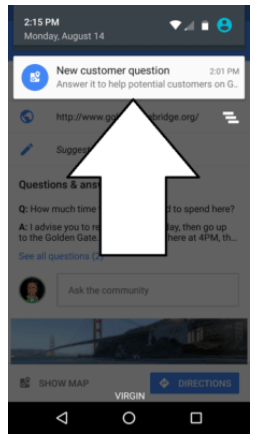 Questions & Answers is a feature that exists outside of the GMB dashboard. In other words, it is not possible for a GMB listing owner or manager to manage the feature from inside the GMB dashboard. 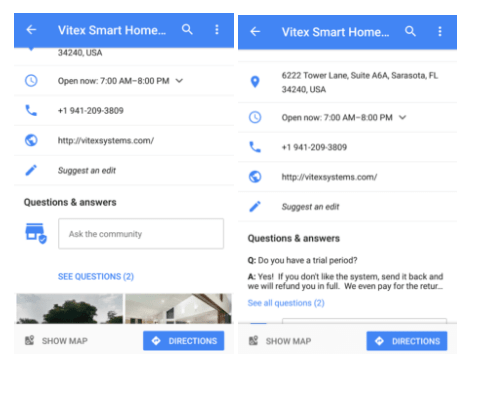 When a user pulls up a business listing on the Google Maps app or on a mobile browser they will now see a section prompting them to ask a question about the business. Here’s a funny example. Business owners can get notifications when a new questions is asked. 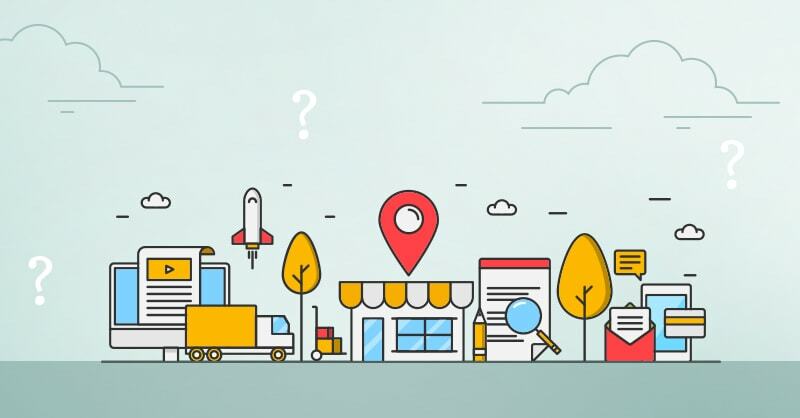 However, the business owner must have the Google Maps app installed and must be signed in with the same Google account that they use to manage the listing in Google My Business. Owners and managers of the listing in Google My Business will receive the notification. However, the user who asks the question does not currently receive a response when an answer is submitted for the question they asked. Can You See Who Asks the Questions? Yes, but you need to dig a little bit. You can see the profile and name of the person who asked the question, but only by clicking on the question itself. On the initial screen that shows the question you don’t see any information about who wrote the question. Business owners should avoid answering questions with a generic “Yes” or “No” response. This is because the person who asked the question can go back and edit their question and the business owner would never know. For example, I could post a question to a business asking if “George” was the owner of the business. And the business owner replies with “Yes.” I could go back and edit my question and change it to “Is the owner of this company treating their employees poorly?” And the answer would still be “Yes.” It’s always a smart idea to try and stay one step ahead of spammers and we have already seen this feature being abused in that way. Read this article about six things you need to know about the Q&A feature. Add an extension to Chrome that allows you to make your browser think you are a mobile device, such as this one. Go to Google.com and search for the business. You should be able to see Q&A now on the listing and should be able to reply and/or comment. Hopefully the above information and tips will give you ideas and inspiration to go and start implementing and utilizing them for your business or your clients. I wanted to leave you with one more tip that you can implement right away. One of the coolest things about the Google Posts feature is that you can literally change the way your Google homepage looks when potential customers are searching for your brand name. Generally, the number one thing that potential customers are looking for at this stage are reviews about your business. And sometimes a business either has a low number of reviews on Google or they have negative reviews that are dominating their Local Knowledge Graph. Like this random example I came across. If I was a potential customer I would not even consider contacting this business. 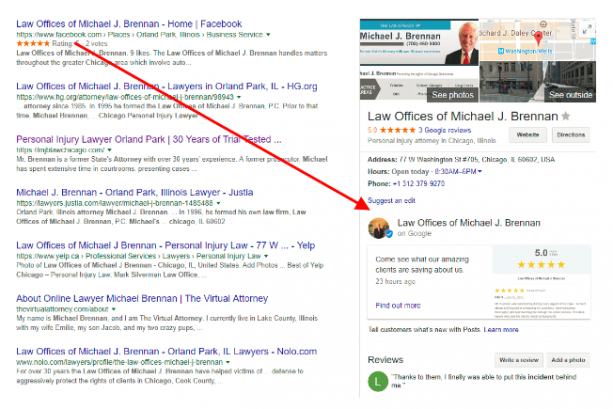 By utilizing Google Posts to highlight your reviews from other sources, like your website, you can transform how the Local Knowledge Panel appears and even add more gold review stars like we did with this example below. All we did was take a screenshot of the gold stars and a review directly from the businesses reviews page on their website. 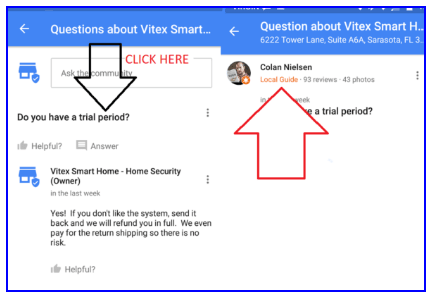 Then we added it as a Google Post and added a call-to-action in the post that links directly to the reviews page on the website. So now we have more gold review stars in the search results AND we can direct potential customers to the reviews page on our website where they can read even more great reviews. We use a tool called Get Five Stars to get reviews on the website for most of our clients. Google will continue to change and these features will continue to be modified. The important part is that you have a plan in place to stay on top of all the new features and another plan in place to utilize them once they are released. To see a complete list of all the changes that Google makes, as well as 200+ pages of awesome Local SEO content, I highly recommend the Experts Guide to Local SEO. Colan started in the local SEO world back in 2010 and is deemed a product expert by Google as a Top Contributor on the Google My Business Forum. 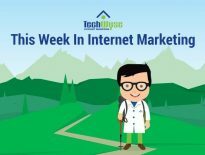 He is a contributor to Moz’s famous Local Search Ranking Factors survey and is a former Google MapMaker Regional Lead. He is obsessed with everything related to Local Search and is active on many online communities including the Local Search Forum where he is a moderator.